What makes an object work? Or an artwork? A group of people? A country? More importantly, how do we go about deciding what works and why? "Dysfunction," the latest main-gallery show at Burlington City Arts, presents the work of 10 artists who use ceramics to raise these questions. Employing a medium long associated with craft and folk art, the exhibition agitates for an expanded view of ceramics' position within so-called fine art. It also asks viewers to reconsider restrictive habits of categorization in a larger sense. The politics involved in "Dysfunction" are twofold. Within the exhibition, works are contextualized as a challenge to rigid distinctions between "high" and "low," and between what ceramics can and cannot do. Second, each artist's work is imbued with its own particular agenda, from supplying activist commentary to catalyzing social interaction. The most overtly political pieces are by Roberto Lugo and Jessica Putnam Phillips, both based in Vermont. 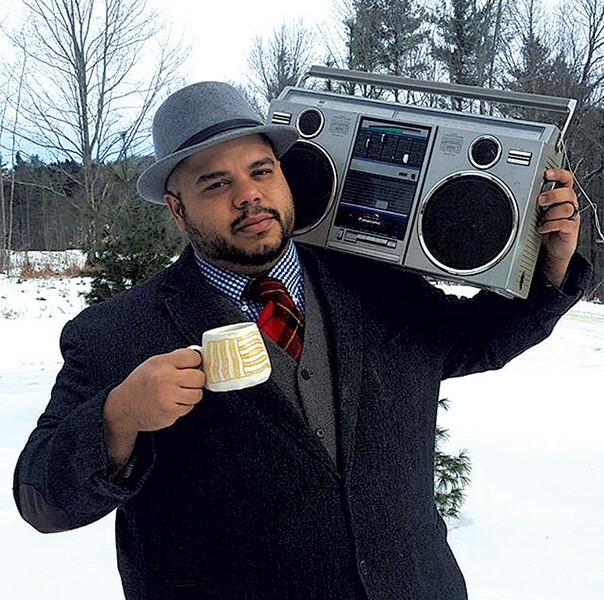 Lugo, a Puerto Rican American who grew up poor in Philadelphia, self-identifies as a "ghetto potter," as well as an activist, rapper, poet and educator. He currently teaches ceramics at Marlboro College. Lugo's "Black Centuries Vase" is a signature piece. The large vessel's open mouth is rimmed with graffiti, which gives way to a host of American cultural and political figures, black and white. These are punctuated by symbols of slavery's legacy — nooses, chains, crosses — in a glaring metallic sheen. 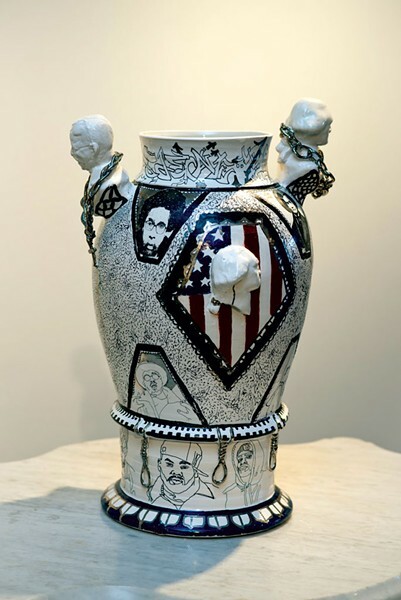 A cameo bust of George Washington is overlaid on both the American and Confederate flags, flanked by portraits of Cornel West, Maya Angelou, Frederick Douglass, a hooded Klansman and, at the very bottom, members of Wu-Tang Clan. Lugo's adoption of a rococo decorative aesthetic is tongue-in-cheek, but it is also a painfully serious confrontation of the historical relationship between (white) European excess and ongoing racial injustice. The plates and vessels of Arlington, Vt., artist Putnam Phillips convey a similar disjunction, but her topic of inquiry is the intersection of gender and modern warfare. 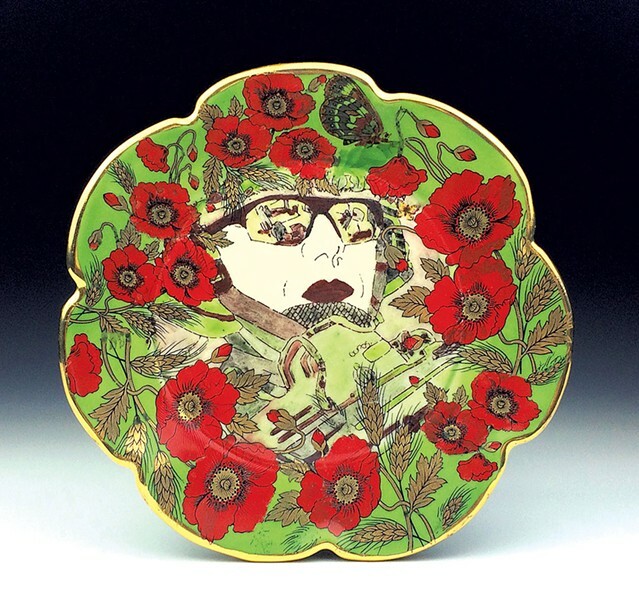 A former military intelligence specialist, Putnam Phillips decorates her plates with ornate flowers, butterflies and gold accents that frame a central figure: a female soldier aiming her gun. The "Ladies in Waiting" series includes 31 such dishes of various sizes, mounted together against a painted backdrop of pastel rose and lavender stripes. Putnam Phillips asserts that her works are meant to question "the concept of serving," marrying the military euphemism of "serving one's country" with the stereotypically wifely duties of serving food to one's family. (It is worth noting that the central figures on the three largest platters in "Ladies in Waiting" each have a gaze that is represented in a distinct way. In "Violet," the soldier's sunglasses reflect the scene she surveys; in "Chrys," the eyes of the soldier are uncovered; in "Poppy," her sunglasses are opaque and offer no reflection.) Like Lugo, Putnam Phillips negates the separation of a "peaceful" domestic sphere from nationalist violence, and instead asks how the two function in tandem. 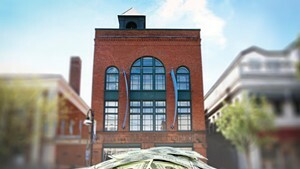 Winooski sculptor Leslie Fry's pieces have political intent, as well, though they are somewhat more subdued. Modeled after classic architectural brackets, "Support Quartet" and "Support Duo" are inscribed with text meant to conjure up the daily and accumulated politics of emotion — of carrying weight, of perseverance and waning strength. Long arms and hands carved into the sculpture remind the viewer of the artist's touch — and that even humanity's most monolithic structures have their origins in the hand. The intricately constructed, wearable works of North Carolina artist Shae Bishop are the most obvious subversion of standard assumptions about ceramic art. Rarely do we think about wearing clay, right? Bishop modeled his "Shirt" at the exhibition opening in January, demonstrating that his sewn-together concoction of small blue- and green-glazed tiles could actually be worn. More impressive is Bishop's "Coat II (the space within)," a highly architectural garment made of small six-sided tiles in blue, turquoise, red and green. The colorful sides of the tiles make up the coat's lining, while its exterior is the drab cream color of unglazed clay. The work by Bech Evans and Margaret Kinkeade has a social functionality and most closely fits the idea of ceramics as utilitarian objects. Evans, who teaches ceramics at the University of Vermont, created "Toolbox for Tea," which is pretty much what it sounds like: an oversize toolbox filled with handmade tea implements and vessels. Describing ceramics as "performative objects," Evans is fascinated with the ritual of Japanese tea ceremonies, and he will host his own tea gathering in the gallery on March 10, as well as a dinner on March 24. Kansas City, Mo., artist Kinkeade's "Half Log Cabin, Arrangement No. 1" references a past event. The work incorporates a wall sculpture and a set of dishes. At the exhibition opening, guests were invited literally to break bread together using Kinkeade's wavy, rectangular plates. When they were finished, the plates were hung on the wall in a grid, still bearing traces of use. 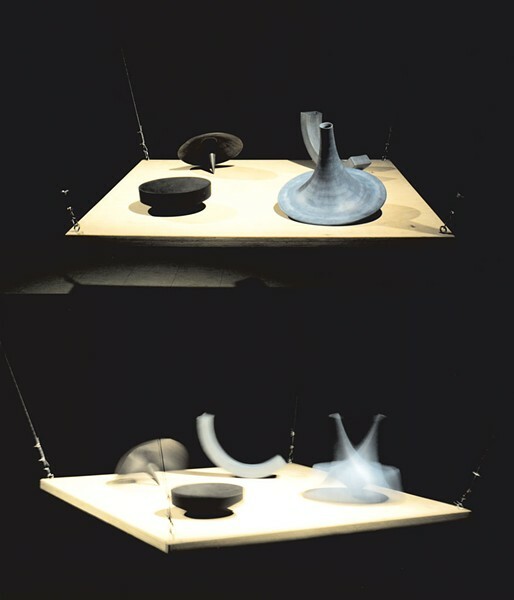 Evans and Kinkeade wed performance and vessels of sustenance to evoke distinctly human themes. Brooks Oliver links depersonalized mass production to experiences of value and fear. His "Wobble Table" features four kinetic sculptural forms, industrial in appearance, atop a wooden plank suspended from the ceiling. Guests are invited to pull a smooth wooden handle that shakes the plank's rigging and sets the pieces in motion. If you've ever bumped into a table holding, say, your mother's heirloom vase, you know the feeling of "Wobble Table" — but with the added stressor and thrill of being in an art gallery. Interestingly, most of the works in "Dysfunction" actually do function — or at least mimic functional objects. Only Oliver, Julia Kunin and Charlie Cunningham created objects that seem to exist solely for their own sake. 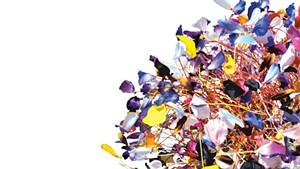 Brooklyn artist Kunin offers the wall-hung "Phantom Flowers," as well as two midsize tabletop sculptures, with her trademark iridescent glazes and themes of biology and geology. Cunningham's "Ode to Emil M. Antonowsky" is a gloriously grotesque memorial bust of the villain killed by toxic waste in the 1987 film RoboCop. The artist also offers his cheeky "This Is Not a Foot," which includes four human foot molds that double as pipes — but almost unrecognizably so. The series references Magritte's "The Treachery of Images (Ceci n'est pas une pipe)," but the joke here is that Cunningham's pieces are both foot and pipe. "Dysfunction" maintains a balance of playfulness and gravity. Its most provocative success is advancing a counter-narrative in a state where ceramics are much loved precisely because of their identity as craft. Far from threatening the preciousness of Vermont's artisanal pottery, though, "Dysfunction" works to complicate, broaden and enliven the experience of the entire medium. The original print version of this article was headlined "Reconsidering Clay"